Freudian dream interpretation – what is that? Most people have heard of Sigmund Freud. He is probably best known for the idea that in our unconscious you will find a jumble of (mostly sexual ) urges and desires, which – if we are not careful – in one way or another will be reflected in our waking behavior, and it will often be in embarrassing/problematic (i.e. non- acceptable) ways. Probably because of this overly simplistic version of Freud’s thinking, his theories are for the most part not a part of todays psychology studies (for example at universities), partly also because it is difficult to scientifically prove precisely what goes on in the unconscious. Psychology studies today are often mostly inclined to focus on what can be “objectively measured”, but more and more psychological dream research (studying what we dream of, how dreams affect us/how our lives are reflected in our dreams etc.) is drawing attention to the importance and the function of dreams and dreamning . Freud to me deserves more attention today because his thoughts were a huge breakthrough, and when you read his books you will be gripped and amazed by his brilliant thinking – which, incidentally, is not confined to his most famous book: “Dream Interpretation” (die Traumdeutung ) from 1899. In this book Freud stated his very famous words that dreams are “the royal road to the unconscious”, in modern day language; a direct reflection of what happens in our unconscious. Also known is his “Psychopathology of Everyday Life” – from which the term “Freudian slip” comes from. Freudian dream interpretation is based on Freud’s model of the human psyche – with consciousness at the top and the unconscious underneath. When we sleep, according to Freud, a lot of psychic energy is released, which therefore allows brain activity on a completely different level than when awake, in which we have to process everything that is going on around us. Basically, Freud thought that the purpose of dreams is two-fold: Firstly, what he called “wish fulfillment” and secondly, to ensure a good night’s sleep (dreams are sleep preserving). Wish fulfillment is about the fact that our dreams reflects the very unconscious (often childish and “forbidden”) wishes we have. For example, according to Freud, to get rid of the father and get the full love and attention of the the mother if you are a boy/man (Oedipus complex), and vice versa if you are a woman: to get rid of the mother and get the full love and attention of the father (Electra complex). The sleep preserving function of dreams is about the fact that dreams incorporate any nocturnal disturbances (noise, vibration, etc.) so that we do not wake up by these disturbing elements. Also his thinking is, that highly embarrasing elements in the unconscious (that could cause us to wake up), are covered up by the difficult language of dreams. The pre-conscious is a function which Freud called “censorship”, whose purpose is to keep all unconscious impulses down. However, it was his idea that the censors are impaired while we are dreaming, and therefore our dreams more easily reveal what goes on in our unconscious – both the “forbidden” wishes we could have, but also repressed experiences we would rather not remember. However, it is – if you ask Freud – not an easy job to interpret a dream because Freud distinguished between the “manifest” and “latent” dream. The manifest dream is the dream we actually dream – that is, the actual content and the actual action in the dream. The latent (hidden) dream is the message which the manifest dream is actually expressing; for example, the forbidden desire or the repressed memory. To identify the latent dream (the actual message in the dream), Freud invented a method which he called “free association”. While his clients lay on a couch in a relaxed and “introverted” condition, completely unobstructed, they could freely tell about what came to their mind when they thought of the individual dream elements. In this way, Freud and his clients worked together to find the dream’s real (latent) meaning. 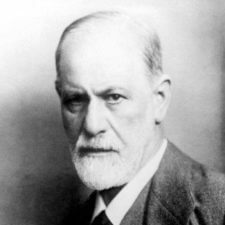 Later Freud came up with a new personality model consisting of an “I (the concious self, the ego)”, a “superego” and the “id” (also known as Freud’s eggs). The ego is the center of the individual – more specifically the individual’s image of itself. In dreams this appears as “I” – i.e. who you are (what you do and say) when you appear in your dreams. Above this is the superego, which represents societal norms and learned norms/rules and expectations. In dreams, this is often expressed as our parents (that is, when we see our parents in a dream they represent the “internalized” expectations, our moral, our rules for living etc. – an internalized sense of something that has become a part of ourselves). Finally, we have the “id”, which includes our unconscious drives, the animal-like and wild sides in all of us. In dreams the id will be reflected as prohibited childish and sexual escapades, wild animals, etc. Furthermore, two other important “dream mechanisms” invented and named by Freud, are “condensation” and “displacement”. Condensation is understood as the ability of dreams to put many meanings into the same single image/symbol in a dream. Displacement is about how “problematic” (prohibited) thoughts and feelings are passed on to another subject in the dream – just like when we in our waking life are enormously angry at a lying, and arrogant man, when the lying, and arrogant man is actually our self – in psychological language called “projection”. Freud is the father of dream interpretation. He has made it clear that our dreams contain previously (repressed) experiences, and he has also made ​​it clear how we in our dreams think more freely (and honestly). Carl Gustav Jung was to start with a big fan of Freud, but later on he broke with him because he also believed that dreams do not have a latent (hidden) content – but they can be interpreted directly from their manifest (actual) content (see this blog post on Jungian dream interpretation). Especially Jung thought that dreams are not – to the same extent as Freud believed – about repressed sexual elements.